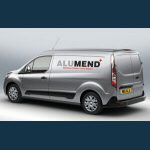 Alumend are able to fix and maintain just about any Aluminium door or window, our service vehicles carry most common parts required to solve your problem in one visit, if this is not the case we have access to a vast list of dedicated suppliers to ensure we resolve your problem as quickly as possible. Please see below to find out our extensive list of services, if your issue is not listed please do not hesitate to contact us as we will more than likley be able to fix it for you. We offer a full repair service to all Aluminium window systems and have parts available, pivot hinges, handles, tilt/turn gearing and all hardware in general. Water ingress in curtain walling is often a problem, our knowledge and expertise can help find and cure the problems caused by water entering a building through the curtain wall. Our maintenance services offer draught proofing, maintenance and repair works – from replacing a single door closer to servicing hundreds of windows of a multi storey building. Including special fittings, draught sealing and gearing. These are tailored to each client's individual needs. We offer two options and are pleased to provide a quotation for each option. Carry out a detailed survey of the windows / doors and submit a schedule and cost of repairs. Carry out a general service of all windows / doors and whilst doing so note replacement parts required and submit reports on any defects found requiring further attention.